As more and more guests bring their own devices with streaming services the use of cable or satellite TV channels has declined, yet the subscription expenses continue to be a substantial monthly burden for hotels and medical facilities. Whether you are trying to reduce TV subscription fees or add value to your hotel or medical facility, the MX-400HY can get the job done. The MX-400HY is specifically configured to enable HDTV on in-house cable TV systems by adding property specific channels, digital signage channels, and hybrid TV/graphics channels. Our goal with this product is to enhance the value and reduce the total ownership costs of the hospitality in-house cable TV network. On its own, the FlexStream MX-400HY is designed to supply ample high quality HD programming to guests TVs as part of our Hospitality AV solutions. The MX-400HY can also be used in conjunction with your existing, or reduced, pay TV channel line up to lower subscription charges. We do this through the use of DTV broadcast content (antenna TV), in-the-clear satellite channels, captured and encoded HDMI/component/composite video feeds, video streamed from files, security camera video channels, HTML graphics and multi-media, and various internet sources. All these features have been combined into one box. Integrating these components not only reduces the cost and space required to host the system, it enables advanced features and simplifies overall operation. A single UI allows you to manage the entire system. Our goal with this product is to enhance the value and reduce the total ownership costs of the hospitality in-house cable TV network. Use FlexDM to manage West Pond devices from anywhere on any device. Create and manage a video playback channel at multiple sites. Check the status of a customer’s RF network. Turn one or more TVs on or off. All this through one web site. 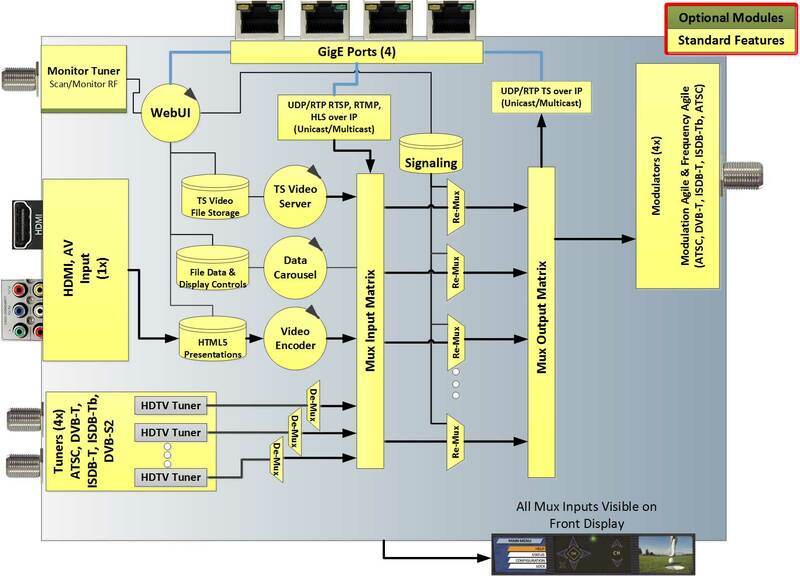 The MX-400HY makes TV headend simple. Other solutions require modulators, capture devices, encoders, multiplexers, TV tuners, Ethernet switches, and lots of cabling. The MX-400HY has it all. It even includes an RF monitor to test your network before installing. Loop or schedule recorded video for playback to create a local attractions channel. Use an HTML5 template to create a multimedia welcome or pub specials channel. Connect to an IP camera to create a weather or beech cam TV station. Economical solution for enterprise cable TV “cord cutters”. Extremely flexible architecture adds value to any TV headend. Interfaces to a wide variety of devices that can be TV channel sources. Designed for easy installation and management. Outputs digital TV via RF (cable TV), and streaming IPTV. Applications in hospitality, healthcare, senior living, entertainment, restaurants and bars, corporate, education, houses of worship, stadiums and arenas, government, military, and apartment buildings. The MX-400HY has be configured to perform the functionality of the following traditional headend components. Video Server / Streamer: Load 30 hours or more of video files onto the MX-400 and create custom TV channels via our built in video server. Create a looping playlist or schedule playback at specific times. Manage channels and video content on one or more systems using FlexDM. Video Encoder (HDMI / Component / Composite / S-Video): Capture video and audio from any of these ports and encode it to broadcast quality standards. This box supports h.264 and MPEG2 video and a variety of audio formats. Digital Signage Player: The HTML5 video wrapper combines video streams with HTML5 media to create a dynamic multi-media experience on a TV channel for viewing on one or more TVs without a digital signage player. This powerful tool is made simple through presentation templates provided by West Pond. See http://www.westpond.com/templates for a list of recent templates. Cable / Terrestrial / Satellite TV Set Top Box Receiver: Integrated DTV tuner replaces shelves of clunky receivers and messy wiring. Demux-Remux Multichannel Multiplexer: Our integrated scalable broadcast quality multiplexer replaces the need for external rack mounted multiplexers. GigE Switch: 4 internal GigE ports reduce the need for and external managed switch and simplify wiring in a mixed LAN environment. Our system can communicate with your IPTV LAN, your in-house LAN, security cameras, and other devices while still leaving spare ports to manage the system. Multi-channel modulator: The MX-400 supports up to 5 frequency and modulation agile modulators. Monitor TV / IRD: The MX-400 front panel display reduces the need for IRDs or diagnostic TVs. The front panel QVGA screen provides a live view of every multiplexer input. The RF monitor tuner scans all channels simplifying installation and enabled diagnosing and resolving issues remotely. Display controller: Every display on your in-house TV network can now be controlled via the integrated display control system. A display control device is installed at the TV that the MX-400 uses to control TV functions such as power, volume and channel. Conceptually this feature is similar to having a remote control that simultaneously sends commands to one, many, or all of your TVs. HDMI, Composite, Component, S-Vid, DTV tuner, IP cameras, and more. Cooling: Fan cooled. Positive pressure, ~20 cfm air flow front to back. 4 independently managed GigE ports. Decode DTV content from RF, IP, etc. Encode HDMI, Component, Composite, S-Video, and other sources. Overlay HTML5 on any video to add multi-media before encoding. Encode HTML5 without video for simple signage channels. Are you looking for a device with a different feature set for your business needs? We can customize our devices to meet your needs. Give us a call 978-562-4306 or contact us today to discuss your needs further.